← Epic Game Of Thrones Theme for Low, Low Brass! 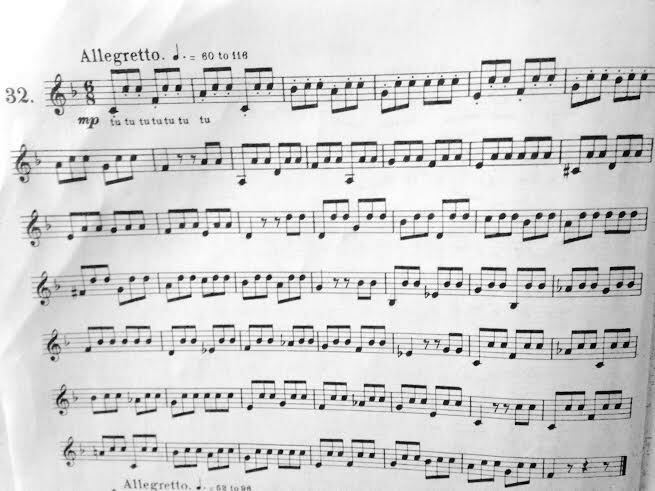 Since I surprised myself by the interest expressed in my post about ARBAN PAGE 125, I thought I’d post another neat interval study I enjoy playing from Arban’s great cornet method. What a fantastic book this is! All the exercises are musical and well written. This study is page 34 number 32. As with page 125, I take a good, full breath and totally ignore the staccato. Personally, I play the notes as broad as I can within the chosen tempo, with no gaps whatsoever between the notes. Actually, I practice this one fairly slowly, I suppose. I am not looking for speed at all, preferring to work on the efficiency of my technique. I try to play each phrase with as much perfection as possible. If I am not happy, I will play that phrase as many times as I have to. I make sure the tongue action is fairly swift, not slow and sloppy, to get the tongue out of the way of all that glorious air. Exercises don’t have to be incredibly difficult to be of great benefit! This entry was posted in The Trumpet o-iii<O and tagged Arban, b, baptiste, cornet, exercise, famous, interval, j, jean, Mendez, method, Rafael, study, technique, tonguing, Trumpet. Bookmark the permalink.